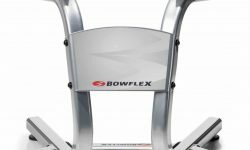 Anyone that is attempting to purchase exercise equipment will instantly think of Bowflex and their highly innovative exercise machines. The commercials are constantly shown on television, which should speak to the overall reputation of the company. Still, many people seem to be unaware that the company actually produces their very own adjustable dumbbells. In fact, there are several different varieties of the Bowflex adjustable dumbbells to choose from. 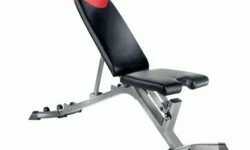 Below, you will learn about the Bowflex SelectTeth 551 Adjustable Dumbbells. Many people find convenience by being able to purchase a pair of dumbbells, instead of making two individual purchases. With the Bowflex SelectTech 551 Adjustable Dumbbells, you receive two dumbbells. Each is capable of being adjusted from 5 to 52.5 pounds. The package includes a holding tray, which is pertinent for the adjustment system. In order to use the adjustment dial, the dumbbells must be correctly positioned in the tray. Of course, the tray serves another purpose, since it helps to prevent the dumbbells from rolling around on the floor. A 2-year warranty is also included and helps to make up for the slightly larger price tag. When you first begin working out, you will likely feel that 50 or more pounds is simply too much. 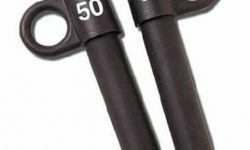 Bowflex understands this wholeheartedly, which is why they took the time to incorporate the turn dial adjustment system. Once you’ve placed the dumbbells in the tray, the dial can be turned to either add or subtract weight. It is possible to adjust the weights by as little as 2.5 pounds for the initial 25 pounds. This offers many more weight possibilities than others adjustable dumbbells. This also allows the user to slowly increase their strength and tolerance levels The dumbbells offer 15 individual weight settings, which means they’re capable of replacing 15 dumbbells. In order to understand the ease of use for these dumbbells, it is imperative to consider the particular dimensions of the set. They generally measure in at 8×15.8×9 inches. Some individuals suggest that the dumbbells are a little too long. However, this offers the capability of adding more weights. The dumbbells are actually fitted with a rubber grip, which ensures that you can grasp them very easily. In fact, it is possible to use the dumbbells, with or without gloves. The adjustment system makes it possible to quickly move from one workout to the next, without a lot of trouble. If you’re interested in getting the dumbbells off of the floor, you will want to consider purchasing the additional dumbbell stand. This additional piece of equipment offers a bit of convenience, since it supports the weight of the dumbbells and gives the user the best form, when lifting. At the same time, it can eliminate back injuries, by helping you avoid picking up the weight’s entirety from the floor. 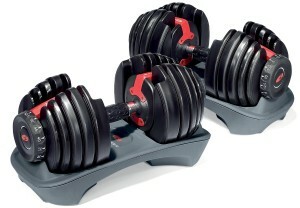 For the overall price, the Bowflex SelectTech 552 Adjustable Dumbbells are definitely sufficient. They’re capable of replicating the weight of 15 different dumbbells and helps to keep your home or gym easy to traverse. The 2-year warranty definitely speaks volumes and justifies the slight price increase. They’re definitely recommended.